Many people associate farming with fresh air and a healthy, robust environment in which to work and live. However, much of the air that farmers breathe can be contaminated with particulate matter or toxic gases that can be lethal. Continued exposure to some of these contaminants can lead to a Farmers Lung condition. Farmer's Lung is an allergy related disease usually caused by breathing in the dust from moldy hay. However, dust from any moldy crop - straw, corn, silage, grain, or even tobacco - can also cause Farmer's Lung. Other potential sources of dust particles include, grain handling, feed handling and processing, and livestock confinement systems. HOW DOES FARMER'S LUNG AFFECT THE RESPIRATORY SYSTEM? The disease causes shortness of breath and a feeling of general illness, either in a sudden attack or as a slow, progressive disease. When people with Farmer's Lung can avoid breathing in dust from moldy crops or feed, they seldom have further problems. On the other hand, lengthy exposure can cause permanent lung damage, physical disability, or even death. Usually, people with Farmer's Lung do not associate their health problem with exposure to moldy hay. Instead, they go to their doctor complaining of breathing problems. It is important to recognize the danger of working with moldy crops and to be able to recognize the signs and symptoms of Farmer's Lung. This enables people with symptoms to get medical help before it becomes a serious illness. Mold spores which are produced by micro organisms which grow in baled hay, stored grain, or silage with a high moisture content (30 percent) are main causes of Farmer's Lung. They become active when temperatures reach 70 degrees Fahrenheit in poorly ventilated areas. Farmers most often suffer from this disease in winter and early spring when stored hay or grain is used to feed livestock and the molds have had time to develop in closed storage areas. The disease is most common in regions with wet weather at harvest time. Farmer's Lung is also more common on dairy farms, especially those not equipped with automated equipment for handling hay or feed. Heavy concentrations of mold spores appear as a dry, white or gray powder in grain or forage. When the feed is moved, billions of these microscopic sized particles become airborne and attach themselves to dust. These particles pass through the body's natural filtering mechanisms (nose, hair, and throat mucous) and accumulate in the lungs where they can cause an allergic type of pneumonia. Repeated attacks can lead to scarring of lung tissue, which impairs its function. Such tissue damage is permanent. Farmers Lung symptoms usually reoccur, and a person can become sensitized to the mold. This means it usually takes less exposure for a severe reaction with each succeeding incident. The symptoms of Farmers Lung are often striking, yet the disease goes unrecognized by many victims and misdiagnosed by physicians not familiar with farm health hazards. Victims and doctors alike often confuse Farmers Lung with asthma attacks, pneumonia, or flu because the symptoms are similar. WHO IS AT RISK OF DEVELOPING FARMER'S LUNG? Farmer's Lung is a risk for adults who breathe dust from moldy hay or other moldy crops. For reasons not completely understood, children rarely develop Farmer's Lung. The degree of risk depends on the amount of dust that has collected in the person's lungs. There is little danger working with loose hay in an open field. However, the risk increases when farmers or farm workers are breaking open bales of moldy hay or straw inside closed barns or cow sheds. A person can inhale an extremely large amount of dust within a very short time while working indoors. Other people exposed to dust from moldy hay; straw or grain include grain handlers, stable employees, poultry workers, and pet shop workers. HOW CAN YOU TELL IF YOU HAVE FARMER'S LUNG? The signs and symptoms of Farmer's Lung vary tremendously. At one extreme, there are the symptoms associated with a sudden attack; at the other extreme, there are the symptoms associated with a slow progressive illness. The allergic response of the afflicted person depends on the sensitivity of the individual and the amount of moldy dust entering the lungs. There are three different types of allergic responses: acute or intense attack, sub-acute or low-level response, and chronic or long-term response. If the person avoids further exposure to moldy dust, the signs and symptoms usually decrease after l2 hours, but they can last up to two weeks. Serious attacks can last as long as 12 weeks. The symptoms are sometimes confused with pneumonia. a loss of appetite and loss of weight. People who are sensitive to dust from moldy crops continue to exhibit these signs and symptoms as long as they are exposed to the dust. This condition sometimes resembles a "chest cold" that lingers throughout the winter. Some people lose weight over several weeks. Chronic Farmer's Lung develops after several acute attacks over a period of years. It afflicts people who have been continually exposed to large amounts of moldy dust. Sometimes, the illness lasts several months and is marked by increasing shortness of breath, an occasional mild fever, and often, a significant loss in weight and a general lack of energy. The symptoms are accompanied by permanent lung damage and gradually worsen as exposure to moldy dust continues. WHAT TESTS ARE AVAILABLE FOR FARMER'S LUNG? There is no single, simple test to distinguish between Farmer's Lung and other types of lung diseases. The most important evidence for Farmer's Lung is the history of exposure to dust from moldy hay or other moldy crops and the development of signs and symptoms 4 to 8 hours later. This is why it is so important for a doctor to know if a patient with shortness of breath has been exposed to moldy crops. WHAT IS THE TREATMENT FOR FARMER'S LUNG? For people suffering from acute attacks of Farmer's Lung, the first step in treatment is to avoid further contact with moldy dust. For serious cases, bed rest is recommended and oxygen therapy may be needed to relieve shortness of breath. Certain medications provide relief from an allergic response during acute attacks and make breathing easier. The long-term use of these drugs is not advisable since they can hide the symptoms of Farmer's Lung without preventing lung damage from re-exposure to moldy dust. No cure exists for people who become hypersensitive to moldy dust. Once people become hypersensitive, they remain hypersensitive for years, perhaps for life. HOW CAN WE PREVENT FARMER'S LUNG? There is no simple method to prevent conditions that lead to Farmer's Lung. Steps must be taken to avoid crop spoilage and production of bacterial or mold spores that cause the allergic reaction. Workers must also take precautions to avoid breathing in spores from moldy crops. Buildings with large amounts of dusty material should be properly ventilated. Consider ventilation rates to remove particles without high heat cost. In heated buildings air-to-air heat exchangers may increase the minimum winter ventilation rate without higher energy bills. Improve air circulation. Make sure that the distribution inlets are managed and operated properly to avoid dead spots. Converting to mechanical or automated feeding or feed handling systems can reduce the amount of airborne mold spores or can reduce human exposure. Wet hay, grain, or other crops can be dried at harvest. If possible wet hay should be ensiled. This is the key to stopping mold growth. Using mold inhibitors, baling hay, ensiling crops, and harvesting and storing grains at the recommended moisture content, limits mold spore growth. It also maximizes the quality of your feed stuffs. During cleaning of barns or stables, dust from moldy crops should be wetted down before being swept to prevent it from becoming airborne. Always use a plastic sheet to cap open silos, don't use plant materials. Hold the edges of the sheet down with heavy weights. Wet down the top of a silo before uncapping the ensiled material. This prevents moldy dust from becoming air borne. This should be done even if the silage was covered with a plastic sheet, because the top layers still tend to mold. Use feed additives. Adding tallow or soybean oil to swine finishing feed to reduce its dustiness makes good sense. Move the work outdoors whenever possible. While this is not usually practical in the case of feeding operations, be sure to open bales that you know are moldy outdoors. Avoid dusty work in confined areas. When constructing new farm buildings or modifying older structures, keep facilities as open as possible. When you have to work with moldy material, try to keep your distance. If you have to break open a moldy bale, do so with a fork, instead of bending over and using your hands. Respiratory protection is the last line of defense against Farmers Lung. The proper type respirator can protect those who have not contacted the diseases or help prevent the diseases from getting worse. Approved, properly fitted dust respirators (e.g., masks with HEPA, High-Efficiency Particulate Air filters) may protect the lungs from spores of molds or bacteria. This equipment, however, is seldom viewed as an easy solution. Professional advice is required for selection of the proper mask and filter. Individuals must also receive training on the proper use of the equipment and procedures for maintenance and repair. 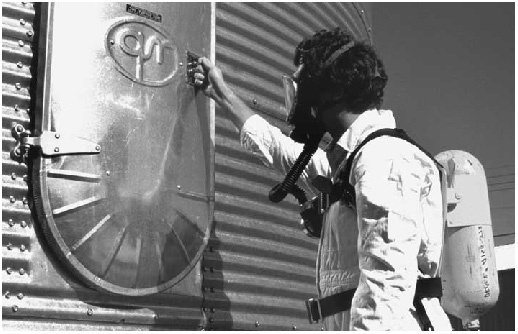 To be effective, the respirator should be worn on every occasion that farm dust is encountered. Make sure the mask is comfortable and easy to maintain but does not restrict breathing. The Toxic dust mask, chemical cartridge respirator and powered air helmet are approved for protection against dust, such as asbestos and they provide inexpensive protection against mold spores. More expensive and sophisticated respiratory devices may be required occasionally. Commonly available disposable respirators for nuisance dusts are not effective against the tiny mold spores. In all cases, however, a key protective measure is to investigate any procedure that can reduce or completely prevent the growth of the heat-tolerant bacteria or molds that create the unwanted dust.